We still have some blackberries from when we went berry picking a few weeks ago. In an attempt to find a way to cook with them, I stumbled across these muffins. I liked the sound of them because they’re full of healthy ingredients and aren’t full of sugar like a lot of muffins can be. This was also the first recipe I’ve seen that uses strawberry puree, I think you could also use applesauce if you prefer. 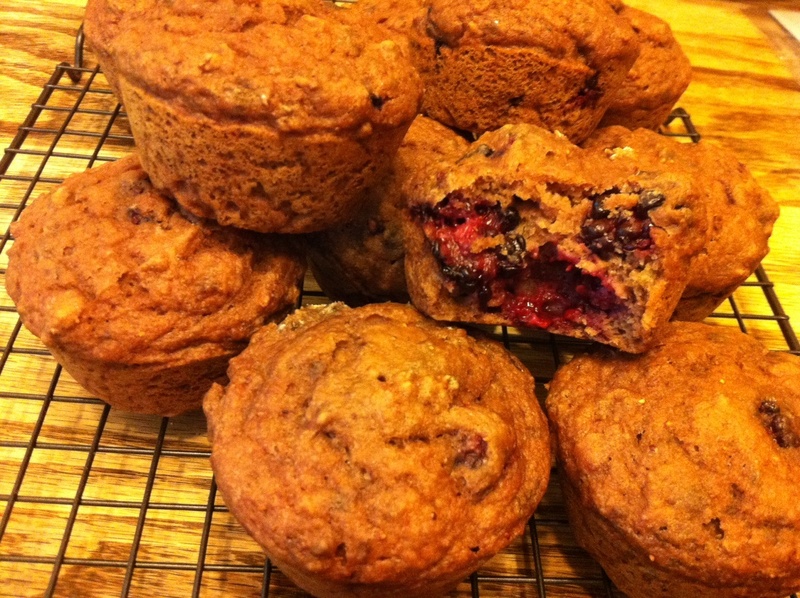 While these weren’t the prettiest muffins (I think because I used thawed frozen strawberries), they sure do taste good. They aren’t overly sweet, so they’re perfect for a delicious healthy breakfast or snack option. In a blender, puree strawberries until smooth and you have 1 1/2 cups. Whisk to combine flour, sugar, baking soda, and salt in a large bowl. In a separate bowl, mix the egg, vanilla, melted butter, and pureed strawberries. Pour into the dry ingredients and stir until just combined. Gently fold in the blackberries. Spoon batter into greased muffin tins and bake for about 18-20 minutes, until a toothpick inserted into the center comes out clean. Cool for about 10 minutes before removing to a wire rack.